Tokyo, Japan—Sony Corporation today announced the upcoming release of the ECX339A OLED Microdisplay featuring UXGA (1600 x 1200 resolution), the highest in class for a 0.5-type. 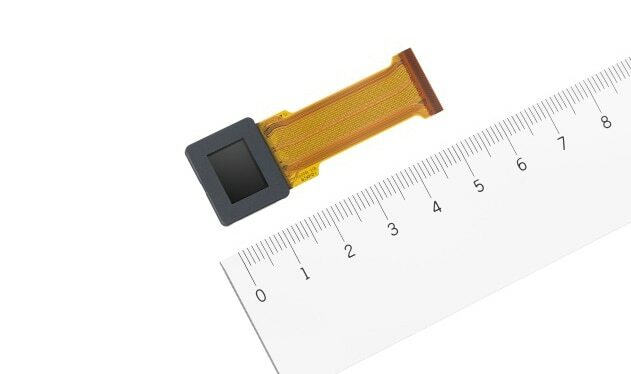 This product achieves the world's smallest pixel pitch of 6.3μm by leveraging Sony's OLED display technology and miniaturization technology, enabling a resolution 1.6x higher than the previous model*1. By employing a new drive circuit design that operates on half the voltage of the previous model*1, the new product achieves the same level of low-power operation as its predecessor but with much higher resolution. When paired with Sony's original driving system*2, a frame rate up to 240 fps is supported—double that of previous product*1. *1Compared with the Sony OLED Microdisplay ECX337A (0.5-type QVGA (1280x960)). A new drive circuit design supports a high frame rate of up to 240 fps*2, nearly double that of its predecessor*1. This has made it possible to capture fast-moving subjects in the viewfinder with higher accuracy, so users will not miss a photo opportunity, delivering a more comfortable shooting experience. In head-mounted display devices, this will help to improve image delay issue for items superimposed on real-world vision of AR and to avoid motion sickness during usage of these kinds of devices.